Established and expanded a tree seedling nursery with a capacity of 40,000 seedlings per year, in two growing seasons, in partnership with an environmental NGO. Grew and planted 2,462 trees of 80 native species. Created ecological corridors of trees between scattered forest remnants, which enabled plants and wildlife to further propagate, migrate and grow. · These areas provided for continuing and ongoing development of more seedlings, which resulted in increased vegetative ground cover plants, attracted native animal dispersers, and accelerated the natural regeneration of vegetation. Provided environmental education for schoolchildren, and vocational training and employment and income for regional residents. Brazilian children look at a model of the riverbank restoration project. The successful completion of this pilot project demonstrated that reforestation is practical and economical, and is expected to spread to other governmental regions with similar problems and needs. And perhaps most important, the project is being transferred and handed off to the large partnering NGO, the Jaguatibaia Environmental Protection Association. This influential organization will assure that the reforestation project will continue, thrive and grow. It will be ongoing and is SUSTAINABLE. These are concrete benefits for the whole regional society. 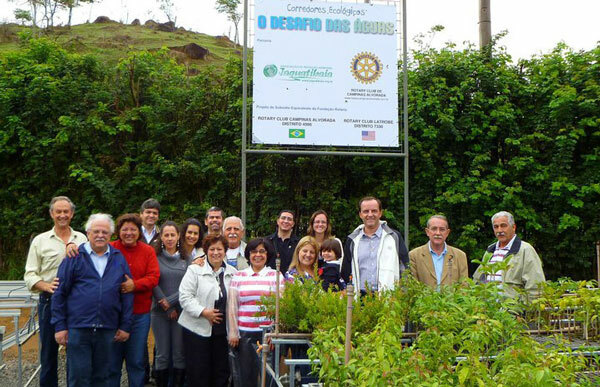 Rotary sponsors many humanitarian, health, and educational programs on both a community and international level. While the scope of Rotary is certainly large, what Rotarians really do can be reduced to three simple but important words – Service above self.